As more people learn they can reverse their diabetes through diet, there is still not enough education or resources helping people make those important changes. I have decided to lower the price of Eat Chew Live by over 40% to $14.95 in order to make it more accessible to the people who need it. 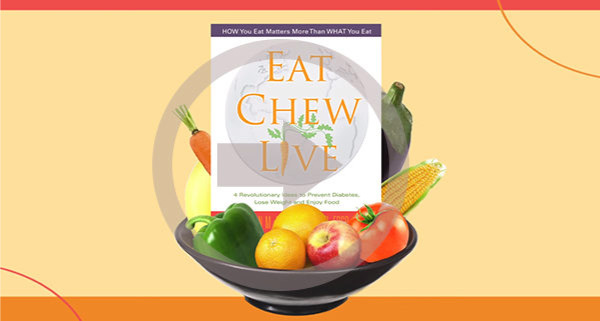 My first book Eat Chew Live has now been available a little more than 2 years now and it has helped several thousand people better understand why they have developed high blood sugar. I hope you are among those who read the book and learned how to alter their eating habits to lose weight and avoid diabetes. Recently I have been sharing news about my second book, Diabetes: The Real Cause & The Right Cure which focuses on those who have already developed Type 2. I invite you to view this trailer video for my book and share this life-changing information and price drop with as many people as possible. I encourage everyone to read Eat Chew Live so they can understand why changing your diet to avoid grains is the major key to preventing high blood sugar and diabetes. It teaches you the natural way to lose weight and maintain reduced weight, and how to eat to enjoy your food. With this knowledge, you can alter your lifestyle to avoid diabetes and live longer and healthier. Thank you for your support over the years. Eat Chew Live Is Now Only $14.95!! 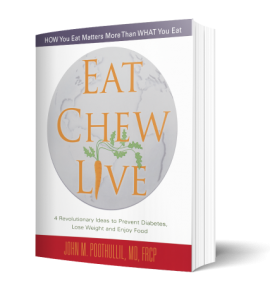 If you are overweight or concerned about getting diabetes, Eat Chew Live provides exactly the new science & inspiration you need. Based on more than twenty years of research, Eat Chew Live offers a revolutionary new explanation of high blood sugar and Type 2 diabetes. There are no special diets to follow or products to buy. Read the book. Learn how you can lose weight once and for all, eat for health, and prevent diabetes. There are no special diets to follow or products to buy. Read the book. Learn how you can lose weight once and for all, eat for health, and prevent diabetes.